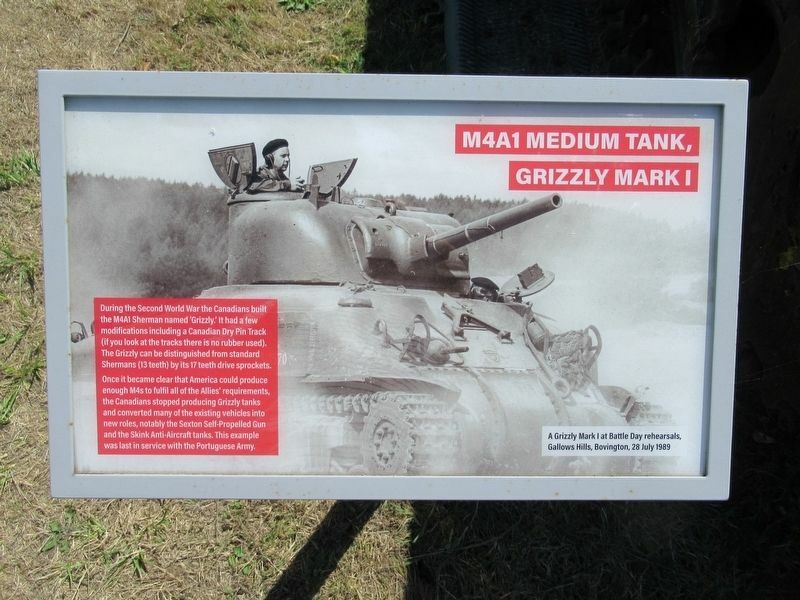 During the Second World War the Canadians built the M4A1 Sherman named 'Grizzly.' It had a few modifications including a Canadian Dry Pin Track (if you look at the tracks there is no rubber used). The Grizzly can be distinguished from standard Shermans (13 teeth) by its 17 teeth drive sprockets. 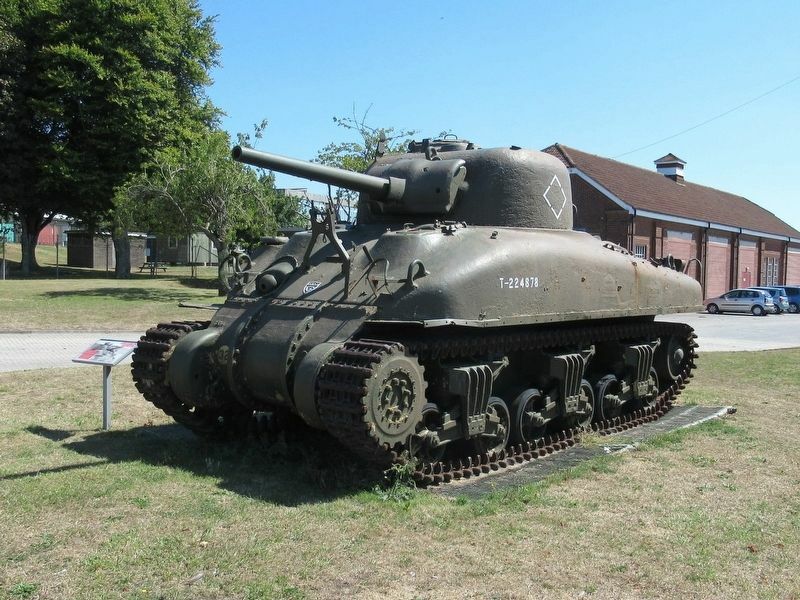 Once it became clear that America could produce enough M4s to fulfil all of the Allies' requirements, the Canadians stopped producing Grizzly tanks and converted many of the existing vehicles into new roles, notably the Sexton Self-Propelled Gun and the Skink Anti-Aircraft tanks. This example was last in service with the Portuguese Army. Location. 50° 41.745′ N, 2° 14.645′ W. Marker is in Bovington, England, in Dorset County. Marker is at the intersection of King George V Road and Linsay Road, on the left when traveling south on King George V Road. Touch for map. Located at The Tank Museum. Marker is in this post office area: Bovington, England BH20 6JG, United Kingdom. Touch for directions. other markers are within walking distance of this marker. Centurion Mark 12 (within shouting distance of this marker); FV603B Armoured Personnel Carrier (about 120 meters away, measured in a direct line); Royal Tank Regiment Memorial Statue (about 150 meters away); Tank Infantry Mark IV (about 150 meters away); The Lawrence of Arabia Trail (about 150 meters away); Household Cavalry and Royal Armoured Corps Memorial (about 180 meters away); Challenger I Main Battle Tank (about 180 meters away); The Kuwait Arena (about 210 meters away). Touch for a list and map of all markers in Bovington. More. Search the internet for M4A1 Medium Tank Grizzly. Credits. This page was last revised on September 21, 2018. This page originally submitted on September 21, 2018, by Michael Herrick of Southbury, Connecticut. This page has been viewed 59 times since then and 5 times this year. Photos: 1, 2. submitted on September 21, 2018, by Michael Herrick of Southbury, Connecticut.